The alarm was set, but the clocks were due to go back in the early hours. I foolishly put my faith in my smart phone to update to the new time automatically, and wake me with enough time to get ready before leaving for the airport. The alarm went and low and behold, I was an hour late getting up. I had to drive from Nottingham to Heathrow to be on the 9am flight to Berlin. I was tired and flapping, not a particularly good combination before joining a press trip. I dashed out of the door, hopped in the car and headed for London, still dazed and confused over what the time actually was and convincing myself that I was going to be very late, or at worst miss my flight. Fortunately neither happened, and I even had time to grab a coffee and breakfast before boarding the plane. I was feeling slightly robbed of the drama of dashing through the airport demanding someone hold the plane but secretly smug that I’d managed to bag myself an extra hour in bed without paying a heavy price for it. I knew my habit of giving myself plenty of time for travelling would save me from disaster one day. Just a short flight from the UK later I arrived at Berlin’s Tegel airport totally composed and ready for the day ahead. I’d always heard that the Germans were efficient, but I got to experience it first hand from the minute I stepped off the plane. Passport control were waiting at the end of the gangway and the luggage was already being loaded in the reclaim area just behind them. It took less than 15 minutes to get of the plane, pick up my Berlin Welcome Card and get on the bus to the city centre. That’s what I call a smooth transfer! From Berlin Zoo, I followed the directions to the 25Hours Hotel Bikini Berlin, which was just a few minutes walk away. I said hello to the monkeys from the parade and headed towards the colourful hotel sign. Guests were already basking in the sunshine outside the hotel bar, and I desperately wanted to join them but time was pressing on. The hotel reception was awesome, with hammocks, retro sofas and some very friendly staff who showed me up to my room. If the decor on arrival wasn’t enough to get me excited, the lift was another psychedelic experience, with the trip continuing into the hotel corridor. I could rattle on about the hotel room all day, but I’ll save that for another post. I had to focus quickly as I was meeting the rest of the press trip for lunch in about an hour, and needed to freshen up. Exploring the room had to wait! We met at the ki-Nova restaurant near the Sony Centre and finally got to meet Dagmar who had invited us all to see the new show, Scotch and Soda at the Chamäleon Theatre that evening. 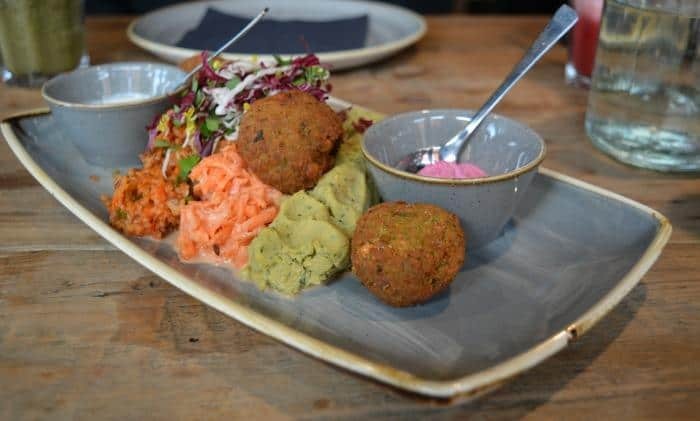 We were presented with the most colourful plates of food, starting with a delightful array of falafel, humous and fresh carrot salad. In some restaurants this could seem like a pretty uninspiring plate of food, but not at ki-Nova. 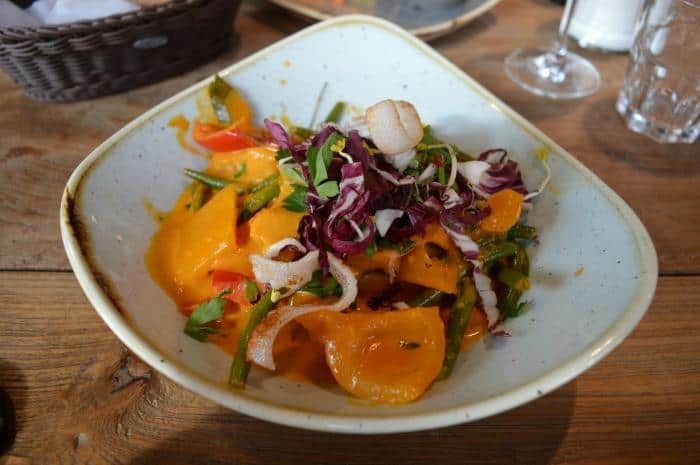 The food was amazing, packed with flavour and was also super healthy too. We were then offered an equally colourful bowl of red curry, which is a dish I can be very fussy about. This version hit the mark and then some, being both rich and creamy and full to the brim with flavour and fresh ingredients. 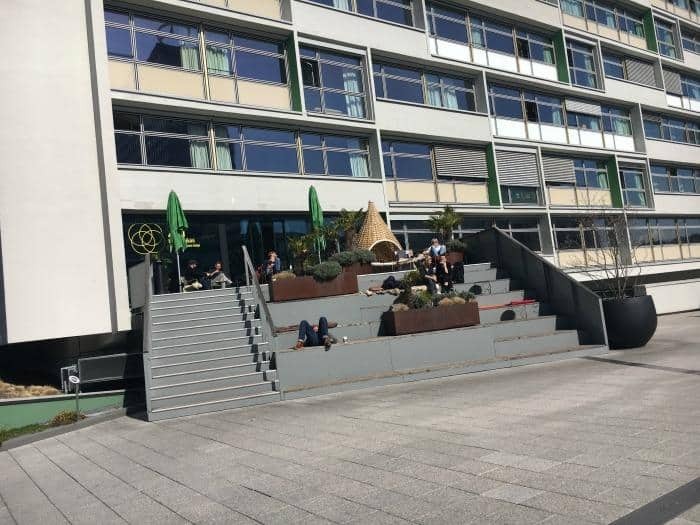 Top all this off with a friendly atmosphere and great service and you’ve got a great place to stop for food in Berlin. Before seeing the show, the bloggers headed off for a bit of sight seeing, and to walk of some of our lunch. We took a closer look at the Sony Centre before heading off in search of the Brandenburg Gate and the Holocaust Memorial. It was a beautiful day for a stroll around Berlin, and also leant itself very well to a spot of photo taking. So much so that we might have been a little later than anticipated getting to the theatre. Fortunately we made it in time for a celebratory glass of prosecco and the chance to find out a little more about the show and the theatre. We took to our seats on the balcony with great anticipation. 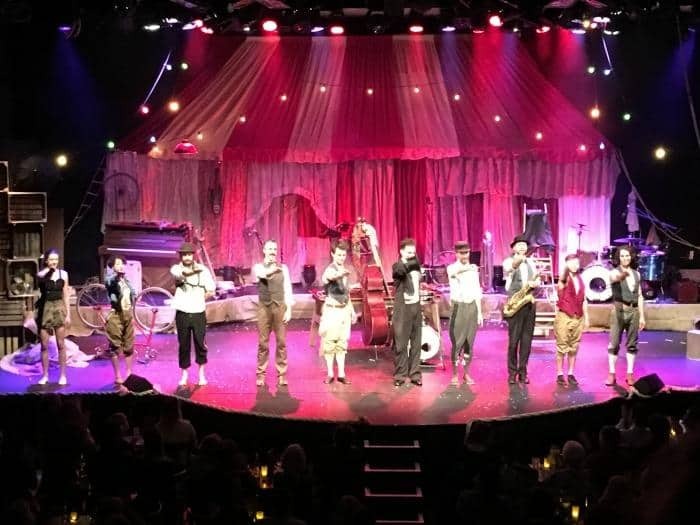 I love live entertainment and was very much looking forward to being wowed by what Company 2 had to offer with their curiously named show, Scotch & Soda. The set and the costumes were a real step back in time, taking us right back to the roots of modern circus. 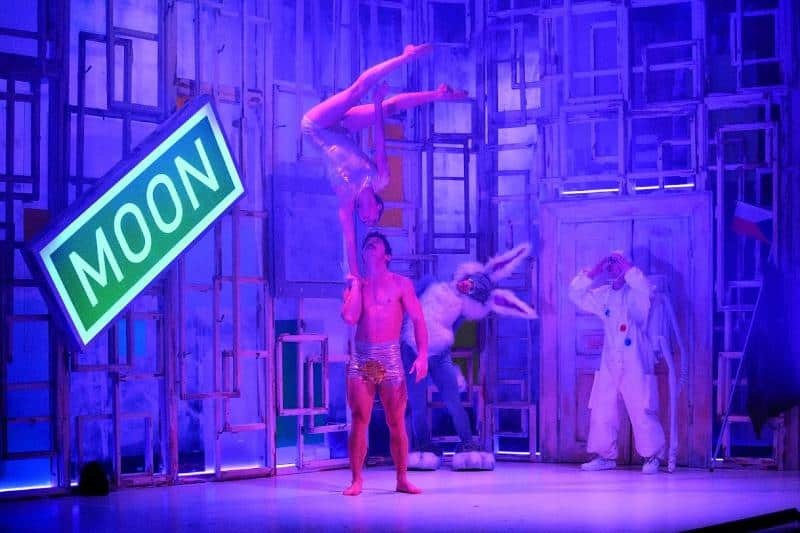 On first impressions, this show could be described as light hearted drunken buffoonery but when you go a little deeper it doesn’t take long to realise that the heady mix of stunts, acrobatics and music are first class entertainment at it’s best. 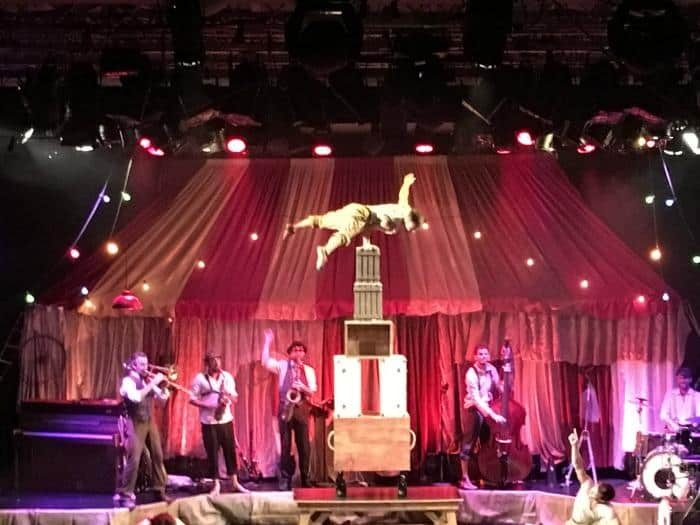 The entire cast are amazingly talented, providing their gripped audience with many hair splitting moments as they proceed to pour drinks while balancing on one hand, stand precariously on each other shoulders and bring you the very best in trapeze and rope circus entertainment. I’ve never seen one, two or even three bodies bend into the positions these guys could muster, and the show had me aghast from beginning to end. The Chamäleon is a small theatre, seating around 300 guests, so you are right on top of all the action. You get to experience the talent and precision of the cast from just a few metres away. Visiting the Chamäleon Theatre to see Scotch & Soda is a very intimate experience indeed, and the perfect way to spend an evening if you are on a short break in Berlin. Add to the acrobatics, some rough and ready humour and fantastic live music, and you have got all the ingredients for a really fun night out. If you have never seen a man in a kilt do a handstand, then Scotch & Soda is going to add this to your list of things you saw in while in Berlin. Now, you didn’t think that was going to happen, did you? Scotch & Soda is showing at the Chamäleon Theatre until August 2017 and you can book tickets here. 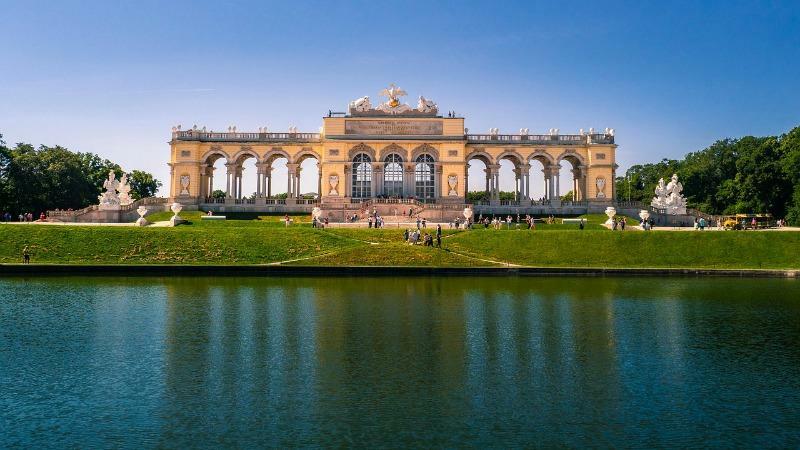 The production is apart of a season of collaborations between the Australian government and Germany called ‘Australia Now Germany 2017’, and you can find out more about this and other events here. If that wasn’t enough fun for one evening, we were then treated to a visit to a local Vietnamese restaurant called Chen Che. The authentically decorated venue made for the perfect setting for some post theatre discussion on how much we had enjoyed being the guests of the Chamäleon Theatre and watching Scotch & Soda. 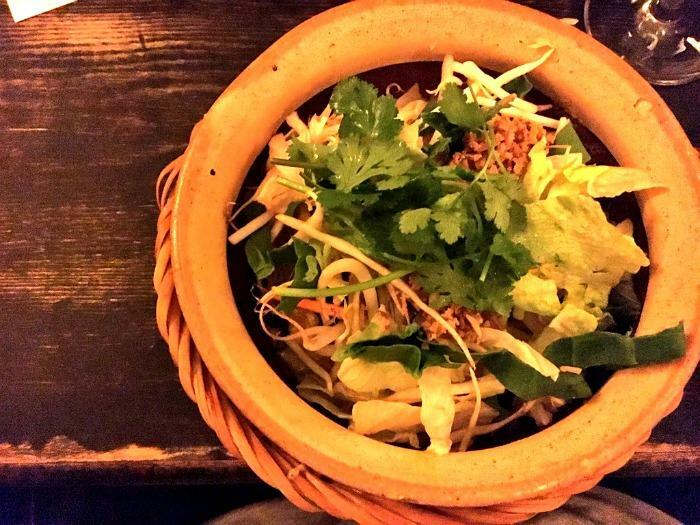 What could be better than being served fresh and authentic green curry, sipping wine and good conversation. It was the perfect end to a perfect day before heading back to the 25Hours Hotel. 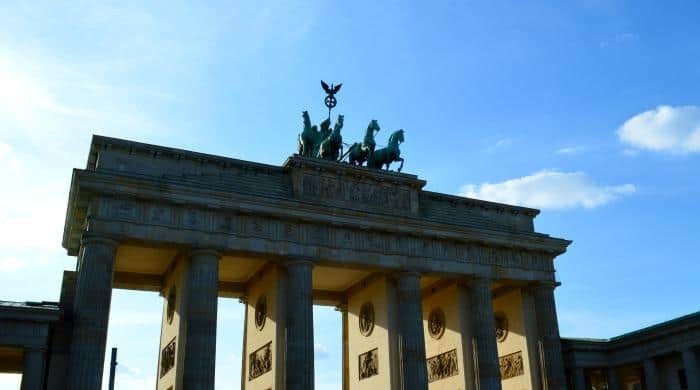 After enjoying a rather delicious breakfast in the sun basked NENI restaurant, some of us decided to take the Berlin City Tour Bus to explore the rest of the sights. The first bus stop was directly opposite the hotel and the bus tour was 14 Euros with our Berlin Welcome Card discount. We visited several of the more sobering sights of the city en route and stopped at Check Point Charlie, saw what was left of the Berlin Wall and saw several Embassy buildings still showing the battle scars of war with scattered bullet holes across their exposed facades. Before saying goodbye to Berlin, we stopped off at a traditional Bavarian restaurant for some beer and bratwurst. It was a great way to end the trip before catching the flight home. Spending 24 hours in Berlin was an amazing experience. It was fun, debauched, sobering, educating and inspiring and there aren’t many cities that can provide this kind of travel rollercoaster ride in such a short space of time. 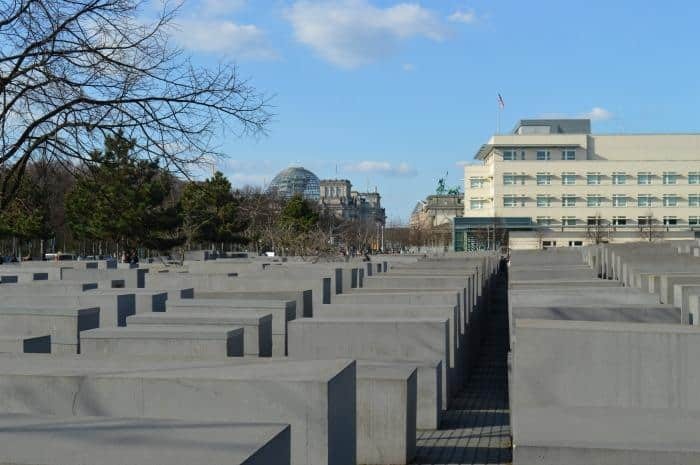 If you’re a history lover you may want to spend longer in Berlin, as there’s so much more to see. It certainly won’t be long before I’m planning my next visit. Thanks so much to Chamäleon Theatre, Company 2, Visit Berlin, Ki-Nova, Chen Che and 25Hours Hotel for inviting me to join them on this whirlwind experience. 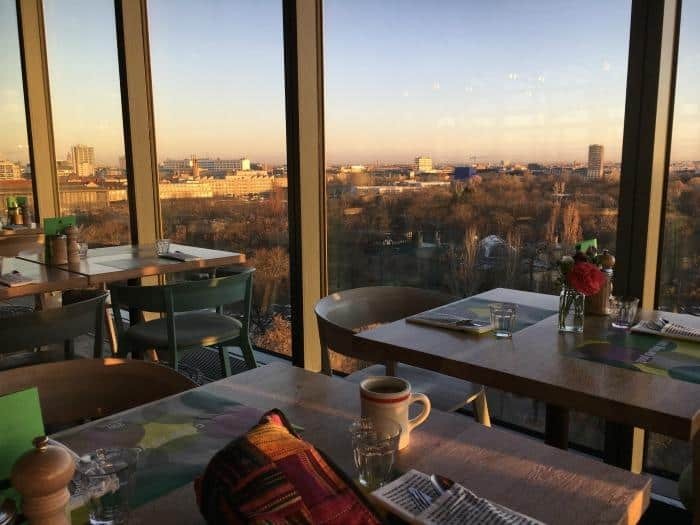 Berlin is a great city to explore, and I would strongly recommend adding a visit to any of these venues or experiences to your visit. I have definitely been left wanting more and hope to share a visit to Berlin with my family to see what else the city has to offer in the not to distant future. 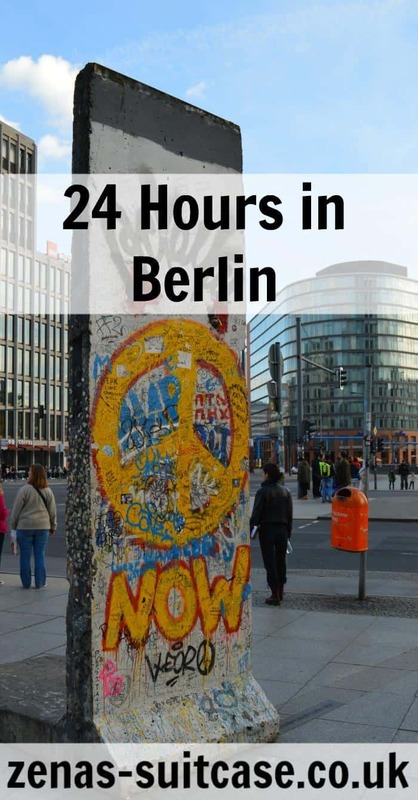 24 hours in Berlin was an organised press trip with the partners mentioned above. The show, Scotch and Soda, sounds very enjoyable. Something that I would love to watch myself. I would love to visit Berlin one day. I am glad to be reading about Berlin because it’s on my bucketlist for this year and my 30B430 list. I can not wait to visit, hopefully I can go in May. Sounds like you had a lovely press trip and the show looks amazing. I enjoyed Cologne and a few other parts of Germany but still looking forward to visiting Berlin one day. Oh my gosh! How lucky that you didn’t miss your flight. I would have been in a right flap. I’ve always wanted to visit Berlin. Maybe one day. It was so nice meeting you during this trip! I can’t believe it’s already been 2 weeks since we were in Berlin and I miss it loads. I wondered what everyone did on Day 2. I pretty much did the same as you, jumped on a city sightseeing bus and saw the historical sights. But I didn’t get around to having a bratwurst which means that I’ll have to fly back to Berlin again for that! ? Berlin looks amazing and I really need to book a visit soon!! Wow, such a nice experience! Very productive for a twenty-four hour stop! I recently spent 24 hrs in Edinburgh, and knowing you are on a limited time frame just made the experience so much more satisfying. I love your 24 hr trip! 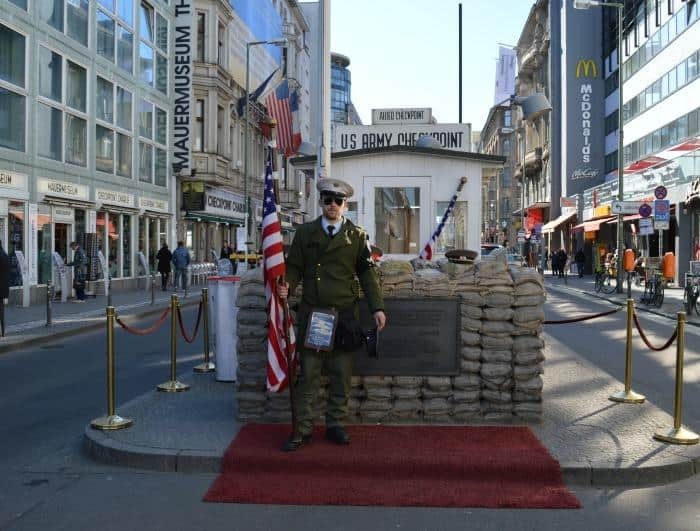 I really would like to go to Berlin and check out checkpoint Charlie, among the other sights. I would love to visit Berlin someday. Beautiful pics as always. Wow this is incredible. Beautifully written, good job.